Is there anything you can do to increase your child’s potential before he or she is born? 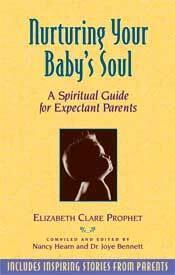 Nurturing Your Baby's Soul offers incredible insights into the inner life of the unborn child. Practical spiritual meditations to help develop your baby’s unique gifts are shared. Includes inspiring stories from parents. Includes charts, illustrations, visualizations, recommended music and affirmations. Available in Spanish in the near future. Dr. Joye Bennett said, “I remember well the peaceful night when Mrs. Prophet and I finalized the first version of Nurturing Your Baby's Soul. Midst our work, you could feel the hush of heaven, of souls waiting to be born. It was a delicate and sublime moment. “Such a vision! As a mother and psychologist, my experiences with children have convinced me that understanding the soul is vital for raising healthy children. Parenting the soul nourishes a love that allows the child to discover her inner creative self—and to thrive in joy. “While preparing Nurturing Your Baby's Soul, I had the honor of listening to story after story of parents' experiences with their children's souls—even before conception! Deeply touching stories of prenatal healing, joyful adoption angels, Tibetan souls coming to American families, as well as the subtle, intuitive impressions between parent and child enriched my understanding of the soul. Before birth, each soul is shown her mission for that life. The mission is very specific to each soul. The soul is wise. She knows the past and its application to the present and the future. And she knows what she needs to fulfill her mission in life. The soul carries with her the records of karma from lifetime to lifetime. Communication with the souls of our children before and during pregnancy is one of the most rewarding experiences parents can have! “For many years, I've known that education begins in the womb. I think I knew that long before I had my five children. “I believe that in all areas of prenatal and postnatal education, what we do as mothers and fathers–providing a stimulating environment, teaching our child and speaking to that child in the womb—awakens faculties that would otherwise die on the vine before the child was considered even capable of using those faculties for learning. BUY your copy of Nurturing Your Baby's Soul: A Spiritual Guide For Expectant Parents paperback at Amazon.com. BUY your eBook for Kindle, NOOK or your Apple devices.